The FIT is a project that assists with employment integration. The FIT project provides a customized support to enterprises and their employees recently hired through a training taken alternatively with a paid internship in a work environment. 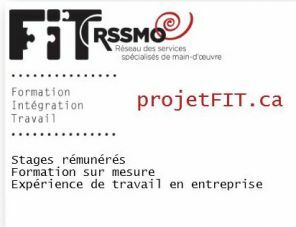 Managed by the Réseau des services spécialisés de main-d’œuvre (RSSMO), the FIT project funds an average of 50% of the new employees’ salaries. The FIT project is a great initiative that contributes to sustainable employment integration (full time hiring) of clients under-represented on the job market, including offenders. The FIT project meets the needs of enterprises looking for qualified workers, makes their recruitment easier, and educates them about the various worker profiles. The FIT project aims at 5 sectors: Office - Trucking/Road transport – Retail trade and Consumer Services - Manufacturing - Marine. access to a large pool of qualified workers. The Centre de placement spécialisé du Portage (CPSP) is proud of the FIT project, for which the success rate has exceeded the initial expectations of our organization: 100% of the CPSP’s clients who completed an internship through this FIT project have been hired at the end of their internship.